Plenty of other quarterbacks received more fanfare after the first weekend of the college football season. The obvious names already in the Heisman Trophy discussion are Stanford’s Andrew Luck, Oklahoma’s Landry Jones and Ryan Broyles, Oklahoma State’s Justin Blackmon, South Carolina’s Marcus Lattimore, Alabama’s Trent Richardson and Boise State’s Kellen Moore. However, judging from his performance against Miami in the rain Monday on national television, Maryland’s Danny O’Brien could emerge as a darkhorse in the Heisman running if he plays the rest of the season like he did against the Hurricanes. In Edsall’s last six years at UConn, the Huskies never threw the ball more than 41.6 percent of the time on offense. In three different seasons, Connecticut kept the ball on the ground more than 6o percent of the time. As evidenced by the chart above, the last time UConn put the ball in the air more than they ran it was seven seasons ago when future-NFL quarterback Dan Orlovsky was under center for the Huskies. Granted, from 2005 through 2010, Edsall had a very gifted stable of running backs that included Donald Brown and Jordan Todman to help ease the pressure on an overmatched group of quarterbacks. In 2005, 2006 and 2008, the Huskies did not have a passer throw for more than 900 yards the whole season. Tyler Lorenzon’s 2,367 yard performance in 2007 is the only time UConn has had a passer throw for more than 1,500 yards in a year since Orlovsky graduated after the 2004 season. Even with his team’s ineptness at quarterback in his last six years at Connecticut, there were reasons to doubt whether Edsall would be able to transform to a more passing-oriented offense in his first season in College Park after featuring a run-first offense for so long. 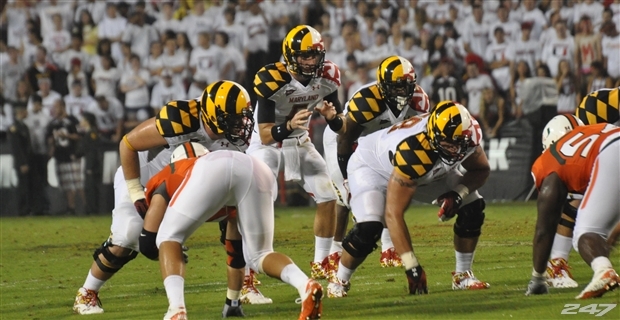 The first Maryland drive of the 2011 season put to rest the doubts that Edsall and new offensive coordinator Gary Crowton would be reluctant to allow O’Brien to air it out consistently in the brand-new Terps attack. O’Brien, who threw for 2,438 yards, 22 touchdowns and eight interceptions last season while completing 57 percent of his passes en route to becoming the first Maryland player ever to take home ACC Freshman of the Year honors, lined up in the shotgun almost exclusively as the Terps spread the field and ran a fast-paced offense that did not allow the Miami defense time to make substitutions. The accelerated offense kept the Hurricanes defense on their heels as O’Brien shredded a weakened Miami secondary, finishing 31-for-44 (70.5 completion percentage) for 348 yards, one touchdown and one interception. The redshirt sophomore quarterback showed maturity, poise and coolness beyond his years with under four minutes to play and the Terps trailing 24-23. 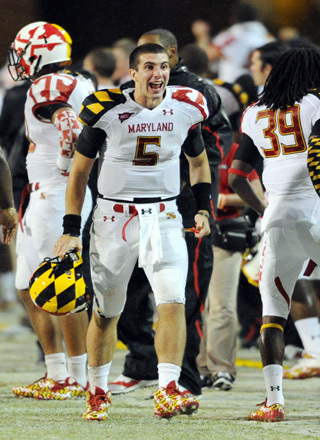 At Maryland’s own 26 yard line, O’Brien launched a 52-yard bomb to Kevin Dorsey to help set up Nick Ferrara’s game-winning field goal. Staying calm and collected under center, O’Brien piloted a fourth-quarter comeback drive to give the Terrapins their first win of the season. The one area O’Brien left for improvement was his redzone management. He led the Terps inside Miami’s 20-yard line on seven of Maryland’s eight drives, but the Terrapins could only muster one touchdown out of those possessions. O’Brien also tossed an interception in the endzone on a play where he could have instead just walked across the goal line to score another touchdown. But while Maryland came away with a touchdown on only one drive that finished inside the Hurricanes’ 20, O’Brien failed to lead the Terps into the redzone only once all night. The Maryland redzone offense should improve in the coming weeks with the return of running back D.J. Adams, who scored 11 touchdowns last year but missed the Miami game due to a violation of team rules. More practice time with his brand-new receiving corp should also allow O’Brien to become more comfortable throwing to his set of weapons in the heavy traffic that comes with passing deep in an opponents’ territory. Sure, five Miami Hurricane defensive starters were suspended for the season-opener Monday night. But Danny O’Brien’s performance, poise under pressure, ability to lead his team consistently down the field, the willingness of the new Maryland coaching staff to open up the passing attack and what should be an improved redzone attack in the coming weeks have to make O’Brien a darkhorse candidate for the Heisman Trophy. 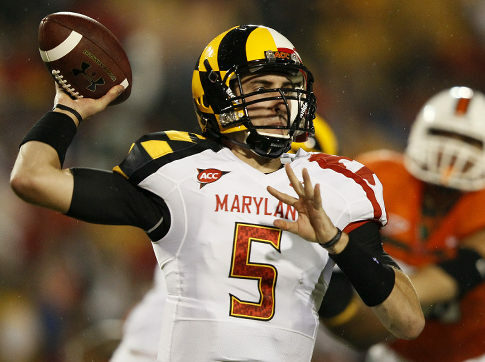 His success has largely gone under the national radar in his Maryland career so far. However, as long as he continues to mature and develop as a quarterback, it won’t be long before the rest of the country takes notice and O’Brien plays himself into the running for college football’s top honor. This entry was posted on September 7, 2011 by Scott Kornberg. 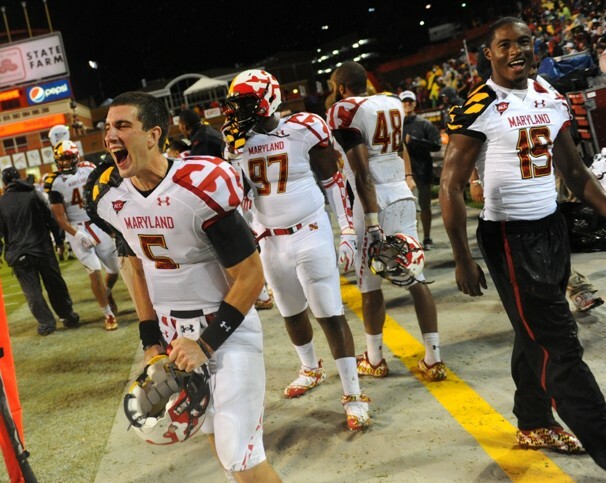 It was filed under Danny O'Brien, Football, Maryland Terrapins and was tagged with D.J. Adams, Danny O'Brien, Davin Meggett, DJ Adams, Gary Crowton, Heisman, Heisman Trophy, Hurricanes, Hurricanes football, Kevin Dorsey, Maryland, Maryland football, Maryland Terps, Maryland Terps football, Maryland Terrapins, Maryland Terrapins football, Miami, Miami football, Miami Hurricanes, Miami Hurricanes football, Nick Ferrara, Randy Edsall, Scott Kornberg, Terps, Terps football, Terrapins, Terrapins football.